Keen to gift a little one something that you know has been ethically made, is kind to the environment, doesn't break the bank and looks stylish too? Thankfully it's not an impossible ask. Here's our top green gifts for babies, toddlers and pre-schoolers. From bags made out of juice bottles, organic cotton toys and brands that give back, there’s plenty of age-appropriate goodies to suit your budget. Soft books are an ideal gift for babies, with textile pages that are kind to delicate skin and high-contrast graphics which help to develop visual skills as well. Organic cotton is a perfect material for these and eco-friendly brands Wee Gallery and Petit Collage have it covered with their designs. Perfect for tummy time, kicking around in the cot, or sat up to enjoy a spot of reading, they're a great first bookshelf addition and a no-stress gift idea as well. Looking for a green gift that can be used for sensory play? We love the Plan Toys Bell Rattle that is as eco and sustainable as it gets. Made from natural rubber tree wood that no longer produces latex, it is then stained with baby-safe organic colour pigments and water-colour dyes. It's a toy that has really been produced with babies and the planet in mind. Another idea is the B.Toys Rain Rush toy, made from hand-stained wood, it provides a calming sound reminiscent of the pitter patter of raindrops. Not stopping there at sustainability, B.Toys use labels and packaging made from recycled paper and printed with soy-based inks to make as little impact on planet earth as possible. Simple puzzles like stacking toys are great for toddlers. We love this design by Grimm’s made from wood sourced from sustainably managed European forests. Coated with natural colours and oils, if babe chews them, there won’t be a problem... and breathe. Tegu offers a similar stacking experience with this magnetic Shape Train. Little ones can begin to learn about the magic of magnets while organising the pieces on the train. Made from eco-friendly hardwood, Tegu also re-plant at least 1 tree close to their factory in Honduras per set sold, as part of the Tegu reforestation programme. 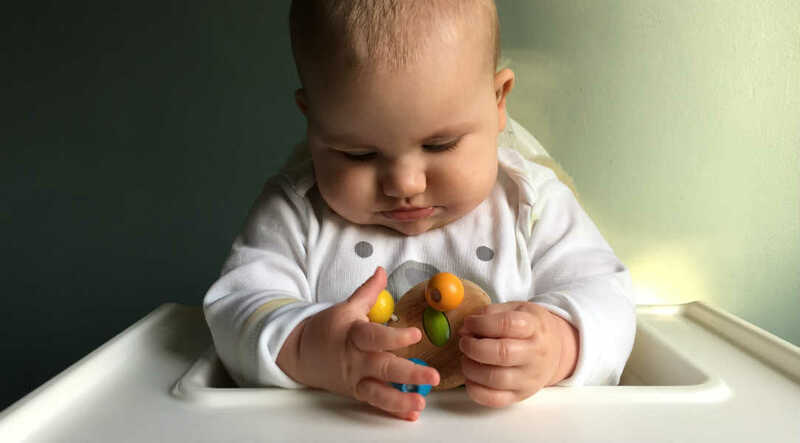 Cause-and-effect toys are great for this age, helping toddlers to learn skills as they play. This Oribel toy which sticks to the wall, invites kids to twist the spinners and make the bird knock on the wood. This style of toy also works fantastically in space-trapped places, such as homes without a designated play room. Made from wood sourced from sustainable forests, it's a toy that will get loads of love, especially as they are also removable and reusable, allowing you to change up where the play happens. Another brand we love is Petit Collage, who only use sustainable an eco-friendly materials. This wooden carousel is a best seller, with a handle that tempts little ones to spin the wheels. It's a cause-and-effect toy that inspires imaginative play, but also fine tunes motor skills too. For toddlers, vehicles are a great gift as they get to grips with imaginative play. Innovative brand Green Toys creates its products from recycled plastic - mainly milk cartons. To date, they’ve used over 24 million cartons to make their toys. The chunky recycling truck is great for early years teaching about reducing waste and the seaplane can be used in the tub, for a playful bath time. Another idea for bath time play is the Plan Toys Sailing Boat. Made from waste rubber wood, formaldehyde-free glue and organic colour pigment and water based dyes, it's an exceedingly good, earth-friendly product. Tableware is a great gift idea for this age, seeing as pre-schoolers seem to eat like dustbins and grow like weeds. 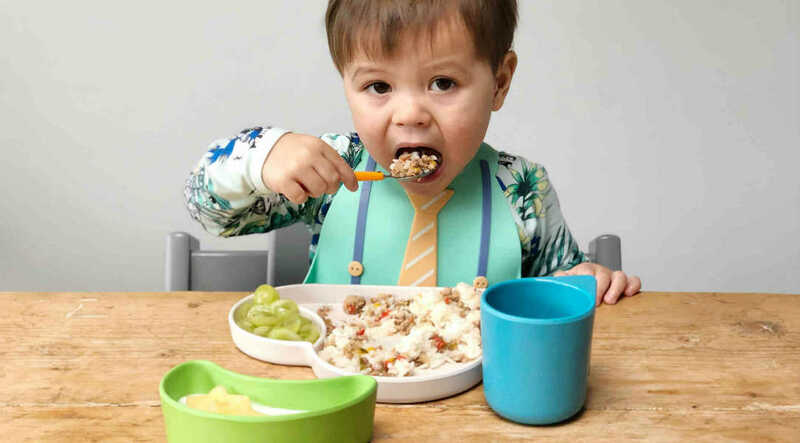 Plastic waste is a huge issue so we love to see that plenty of brands are designing amazing green tableware for kids, that looks trendy but is kind to the environment as well. Tum Tum, EKOBO and Liewood all manufacture earth-friendly bamboo tabletop products, that can returned to the earth once their dinner days are done. Their designs are modern but appealing to children, helping to make time at the table less of slog. Tum Tum, Eco Cloud Feeding Set. Around this age, kids really enjoy getting stuck in to art and games too. Looking for a gift for a little one who loves sticking and colouring? An eco-friendly activity kit may be just up their street. This Recycle Me Set is a great shout, turning household rubbish into art. Each box includes all the materials and instructions required to create themed models from everyday disposables. Less waste = more fun, as well as the opportunity to introduce kids’ to the importance of living more sustainably. We also love this playful game by Petit Collage that encourages kids to take a guess at what object they are. But that isn't where the goodness ends. The entire kit is made from recycled materials and printed with vegetable inks too. Awesome. Perhaps school is on the horizon for your little one and you are looking for a great bag? Step in Engel who create recycled goodies perfect for pre-schoolers. This modern sustainable brand makes eco and great looking bags out of recycled juice bottles, with adjustable straps that allows kids to make it fit down to a T. You can't really ask for any more from a bag can you?